Self-Care – Connect, meet or make time this winter! Self-Care – eat better and move more! As part of our county-wide campaign to raise awareness of how ‘self-care’ can positively affect your wellbeing, we are launching a new campaign with a focus on eating healthily and increasing activity levels to reduce or prevent your risk of diabetes. If you’re convinced that diabetes is something that can’t affect you, then it might be time to think again. 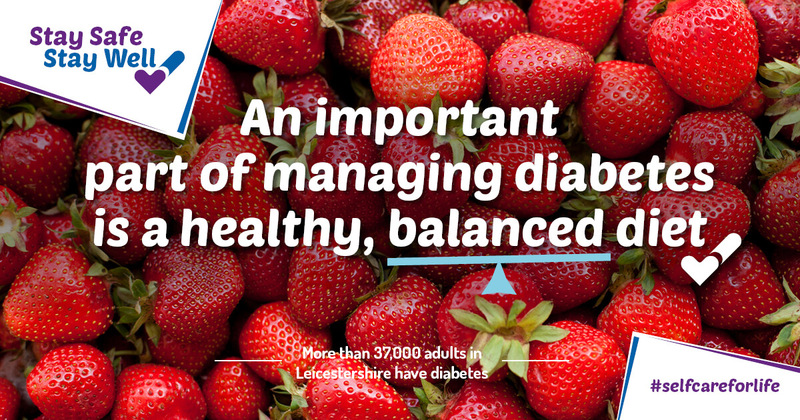 In Leicestershire more than 37,000 adults and 6.7% of the total population are living with diabetes. There are two types of diabetes. Type 1 is where the body’s immune system attacks and destroys the cells that produce insulin and unfortunately there are no lifestyle changes you can make to lower your risk. With Type 2 diabetes the body doesn’t produce enough insulin, or the body’s cells don’t react to insulin and this type is far more common. Symptoms of diabetes include feeling very thirsty, urinating more frequently at night, feeling very tired and weight loss or loss of muscle bulk. If you experience these main symptoms see your GP as soon as possible. Type 2 diabetes is often linked to being overweight or obese, so making healthy lifestyle changes can help to reduce your risk. With 64% of adults in Leicestershire either overweight or obese, we want to encourage as many people as possible to look after their wellbeing through ‘self-care’.